Do your science engagement events feature a diverse range of speakers? Are they accessible to people from low-SES backgrounds, children and people with disabilities? Such questions arose for science communicator and creative director Holly Kershaw when she participated in an International Visitor Leadership Program hosted by the U.S. State Department. 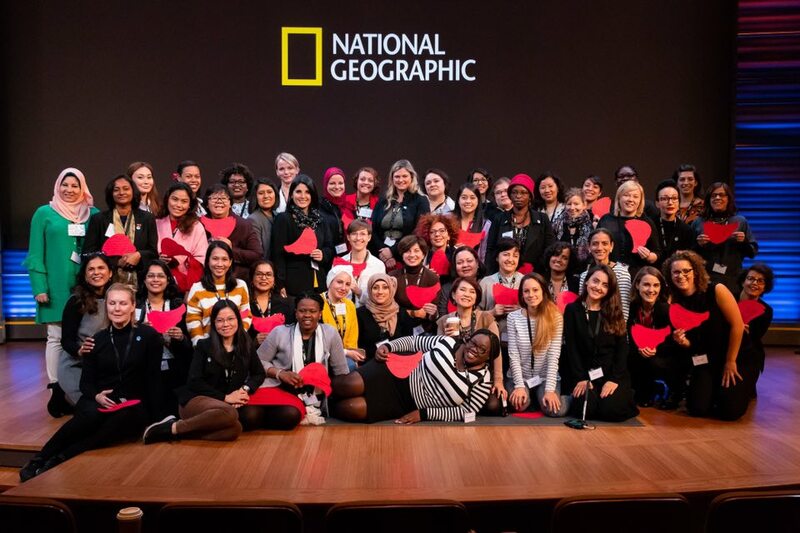 A two-way learning experience, the Leadership Program I attended in late 2018 with established and emerging leaders from around the world was entitled: “Hidden No More: Advancing Women in STEAM Fields”. Designed in the wake of the incredibly popular Hidden Figures movie that introduced to the world the female computers at NASA, and the idea that there are still women all around the world doing important work who are essentially hidden, the program brought together 50 women from 50 countries. Participants were drawn from the STEAM disciplines and across private, public and non-profit sectors of their community —each working towards the similar goal of advancing women in STEAM. Bringing together this group of trailblazers would have been enough — we had so many who were the “first” or the “only”, and the conversations within could have spanned three weeks on their own. But we also got to tour ten cities collectively, with an appointment schedule jam-packed with women from across the USA who are at the top of their STEAM fields, eager to share their experiences and learn about ours. The women in STEAM leaders got a rockstar’s welcome at Fox Studios in Los Angeles! Professors, heads of government agencies, teachers, museum educators, entrepreneurs, parents, students and many more people generously gave their time to talk with us. And, while conversations began around questions relating to Women and Science, they often turned into much more than that. To say that I learned a lot in these three weeks is an understatement. Though the focus of this program was women, these ideas hold true for diversity in STEAM in general – just replace “women” with any other minority and you’ll find parallels! Being a successful woman in science, engineering, technology does not come easily. Most have had to fight for respect, recognition, promotion and for their voices to be heard. This can be lonely, and having networks of others who’ve shared similar experiences can be invaluable. Women need to support other women. The leaky pipeline of women is obvious in all countries, even those with parental leave policies and diversity quotas. “Meritocracy” is often not merit based, and selection processes are often biased, even if it is unconsciously, against women and diverse applicants. In some cultures, the idea that marrying and having a family is more important than a career also prevents women from succeeding. Representation matters. We spoke about the importance of role models in so many contexts. The “Scully Effect” of having successful women scientists in the media is a real thing, and the idea that “you can’t be what you can’t see” is real, and so we need to continue to promote women so that we can encourage the next generation of young women to pursue these careers. Now back home, I realise that there’s a need for all of us to consider these kinds of learnings when we plan events and do outreach. When organising community events, we should aim to attract audiences that are not simply representative of our communities. Do our events feature a diverse range of speakers? Are they timed so that those with young children attend? Are our event spaces inclusive? Are we designing programs that are accessible to people from low-SES backgrounds and people with disabilities? Most importantly, are we creating event spaces where people feel welcome and included? I’m keen to explore these questions in an effort to make Australian science engagement programs truly accessible and inclusive for all. Feature image taken at the National Geographic Society in Washington, D.C. courtesy of 21st Century Fox. Holly Kershaw is Creative Director at Fizzics education. She is grateful to have had the opportunity to participate in the International Visitor Leadership Program and welcomes questions and or comments: holly.kershaw@fizzicseducation.com.au.